It seems to me that every year or so for the past decade, I’d see a story in the news reporting on the minimum extent of arctic sea ice, comparing it to previous years, etc. Sometimes it’d be reaching a new minimum, sometimes it’d be the second or third worst on history. 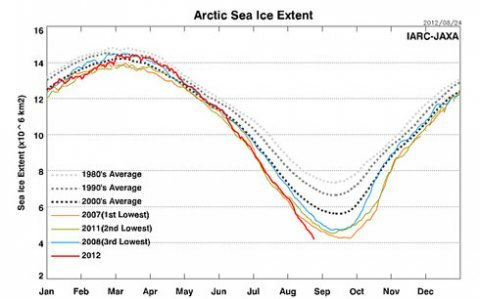 This usually occurs around late September or early October, when arctic sea ice usually hits its minimum for the year. So, it’s too soon to be hearing doom and gloom about the arctic this year, right, since we’re still in August? As the graph above shows, we probably haven’t reached the 2012 arctic sea ice minimum point yet…but we have already set a new record for minimum sea ice extent in the arctic. If historic trends prove true, we have another month of so of melting before we reach the actual minimum for this year. 2012 is, unfortunately, providing global evidence of the impact our species is having on this planet through CO2 emissions and global warming. While the technology exists to halt this slide into oblivion, we so far lack the willpower to do something about it. On the contrary, the Republican party is in outright denial of the issue, and a very large percentage of Americans are blindly following along. Are we past the point of ‘acceptable’ climate change?